You are currently browsing the archive for the Arizona category. The Original Tequila Sunrise as served in the Wright Bar at the Arizona Biltmore. After my somewhat disappointing visit to Frank Lloyd Wright’s Taliesin West, I felt like I needed a drink, and what better place to get one than at the Arizona Biltmore’s Wright Bar, named after the famed architect. Their house cocktails seemed overly sweet and uninspired: something called a Wright Passion (pomegranate liqueur and Grand Marnier); Wright’s Root Beer Float (Appleton rum & root beer with whipped cream—yuck). Great story. God only knows if it’s true. Everything I’ve ever read says the Tequila Sunrise was created by a San Francisco bartender named Bobby Lozoff at the Trident restaurant in Sausalito around 1970. “The Tequila Sunrise was invented here,” Lozoff told a National Geographic writer last February. Lozoff says he and another bartender used to make traditional vodka or gin cocktails with tequila. Lozoff says that his drink was a tequila version of a Singapore Sling. Two things might suggest the veracity of Lozoff’s story: There are no mentions of a Tequila Sunrise in any major cocktail guides from the 40s or 50s or even 60s; the first “Sunrise” cocktail I’ve come across is in The Bartender’s Standard Manual, published in 1971. However, there are a couple of other things to consider here. One is that nobody published tequila cocktail recipes prior to 1970 (in my copy of the classic Esquire cocktail book, The Art of Mixing Drinks, published in 1956, there are exactly three tequila cocktails: Margarita, Tequila Sour, and something called a Prado Cocktail , from the Hotel Del Prado in Mexico City, which is just a Gin Sour made with tequila). Also, the Tequila Sunrise created by Gene Sulit at the Arizona Biltmore had little to do with the Sunrise the Eagles were singing about in the early 70s. 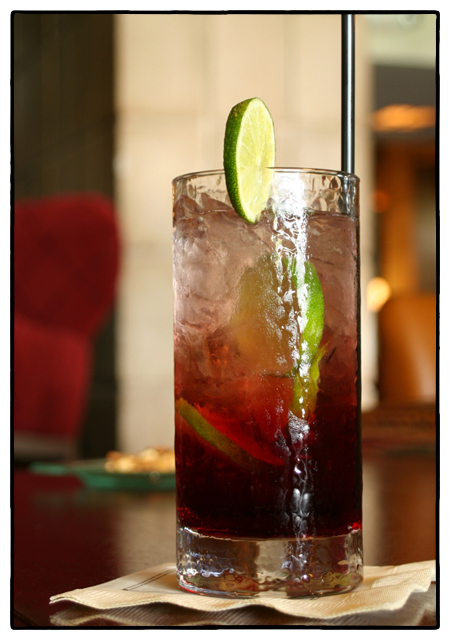 It was made with tequila, fresh lime juice, crème de cassis, and club soda. No orange juice, no grenadine. The 1971 version in the Bartender’s Standard Manual is sort of a compromise between Sulit’s Sunrise and the version we think of now; it calls for grenadine, but no orange juice. In any case, I ordered the Arizona Biltmore’s “Original Tequila Sunrise” and it was light, refreshing, and much less cloying than that nasty drink from the 70s. I’d highly recommend you give this version a try. Fill chimney glass with cracked ice. Add tequila, crème de cassis, and a squeeze of lime. Fill with soda and garnish with a lime wedge. 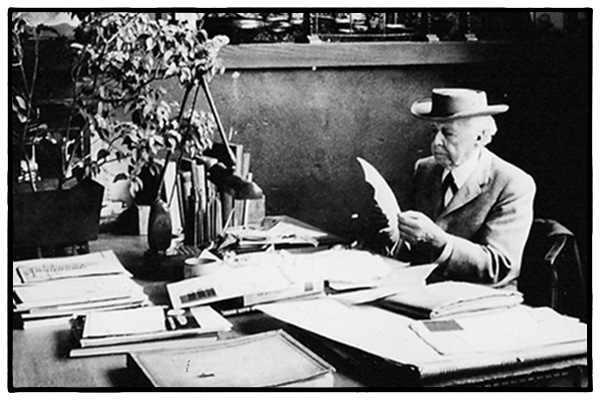 The eccentric–and rather short–Frank Lloyd Wright. Yesterday morning when I drove out there from the Arizona Biltmore, it was an easy jaunt down the freeway. I walked up the gravel path, beneath the vine-covered pergola, and stepped in to Wright’s workroom, immediately banging my head on the transom. According to her, Wright, who was only 5’8”, figured if you were any taller “it was a waste of material.” Consequently, everything at Taliesin is rather low to the ground—including the doorways and ceilings. I came to Taliesin West expecting to feel awe and astonishment, and did I? Not really. The setting is gorgeous. The sloping walls built from rocks and sand scooped up out of the desert, not so much. The whole thing felt rather dark and closeted to me. I wanted big open rooms with expansive walls of glass overlooking the Sonoran desert. Instead, it felt kind of Hobbitish to me; little warrens and dark nooks. A place for monks. Or short eccentric architects. Olgivanna Lloyd Wright: Devil or Angel? Frank Lloyd Wright with his controversial third wife, Olgivanna. 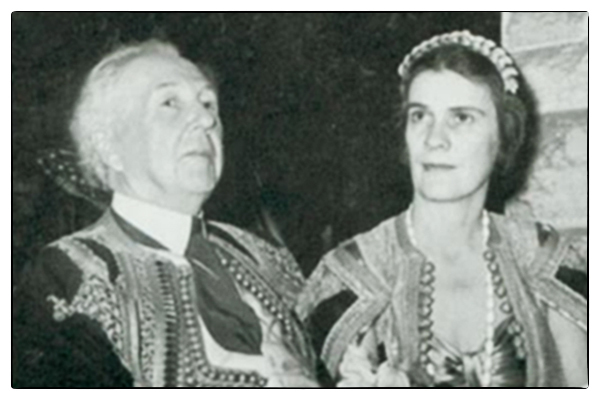 It’s hard to know what to think of Olgivanna Lloyd Wright, Frank Lloyd Wright’s third wife. A documentary on her life calls her “A Partner to Genius.” Less generously, others who knew her—including family members—have called her a tyrant and a charlatan. They met at a dance performance at a Chicago theater in 1924. Both were married to other people at the time, but that didn’t stop them from somewhat scandalously shacking up together at Taliesen in Spring Green, Wisconsin. After divorcing their spouses and marrying in 1928, they moved “from the cool wooded hills of Wisconsin to the barren desert heat of the southwest following a bout of personal issues that would nearly end Wright’s career,” according to a history of Frank Lloyd Wright. Even after Olgivanna died in Scottsdale in 1985, she continued to have a strange control over the legacy of Frank Lloyd Wright. Before her death, she planned the removal of Wright’s body from its Wisconsin grave, which was then cremated, mixed with her own ashes, and used in the walls of a memorial garden built on the grounds of their home at Taliesin West. The Wisconsin legislature prohibited the removal of his body, but nonetheless her plan was carried out successfully. What Olgivanna wanted, Olgivanna got. Even in death. The pre-cast concrete blocks for the Arizona Biltmore feature a geometric pattern said to represent a freshly cut palm tree. 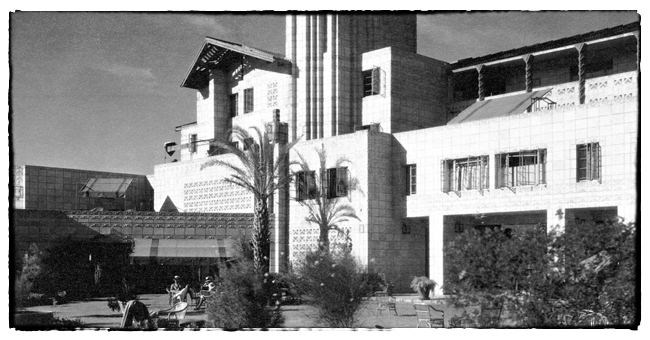 Even though Frank Lloyd Wright didn’t actually design the Arizona Biltmore he certainly influenced it. The pre-cast concrete blocks, designed by the architect Albert Chase McArthur and sculpted by Emry Kopta, a prominent southwestern sculptor, were inspired by Wright’s use of indigenous materials. 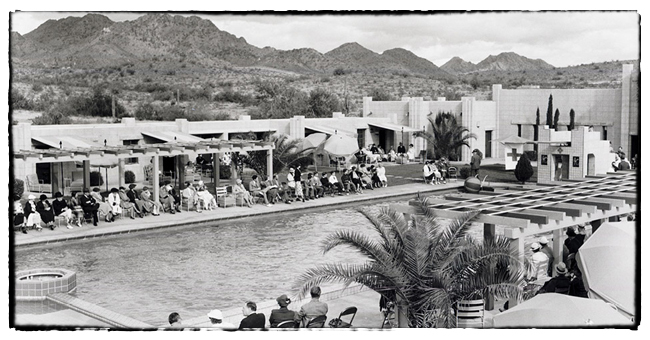 Of course, Wright made his own splash in the desert not far from the Arizona Biltmore with Taliesin West. I’ve heard all the stories, of course. How Wright left his second wife and took up with a rich divorcee out here in the Arizona desert, which, at the time, was pretty much at the end of the earth. They say he built Taliesin West as his winter home. I think he built it where he did because it was almost impossible to get to and a great place to hideout while he was trying to figure out his second—or perhaps third—act. I’m planning to go out there tomorrow to see for myself. This hotel has a fascinating history. A lot of people think of it as a Frank Lloyd Wright property but the resort was actually designed by one of his acolytes, Albert Chase McArthur (who studied under Wright from 1907-1909 in Chicago). The hotel opened at the start of the Great Depression and when the construction costs doubled, one of the original investors in the project, the chewing gum magnate William Wrigley, Jr., became the sole owner. Even with the Depression in full swing, Wrigley dumped more money into the desert resort, including building the fabulous pool I’m sitting by right now in 1930 (Marilyn Monroe called it her favorite pool in the world). They say that when the Arizona Bilmore opened on Feb. 23, 1929, the media crowned it “The Jewel of the Desert.” More than 90 years later, it still is.